A person's identity is expressed through many things, including their posture, clothing, hair, bodily adornments, objects and surroundings. It's not even necessary to show all of a face, or even any of it, to express something significant about a person. "Beauty Mark" Oil 8" x 10"
"Beauty Mark" is one of my favorites and it has also been a prize winner. The glowing, reflected light in the model's skin beneath her jaw and the delicate sheen on her nose and cheeks tell much of the story. "Tango" Oil 16" x 16"
The Hispanic woman in "Tango" was posing with a man, but I chose to focus on the flower piece in her hair and the predominant back-lighting on her face and shoulders. Something about her pose and adornment reminded me of dance, specifically the hesitation steps in the tango. "Zebra Pants" Oil 16" x 12"
In "Zebra Pants" note the red of her elbow and hands are, however, a natural variation in human skin. Put your hand on your bare stomach and note the differences in color. Unless you've been doing a lot of sunbathing, there will be an obvious difference. 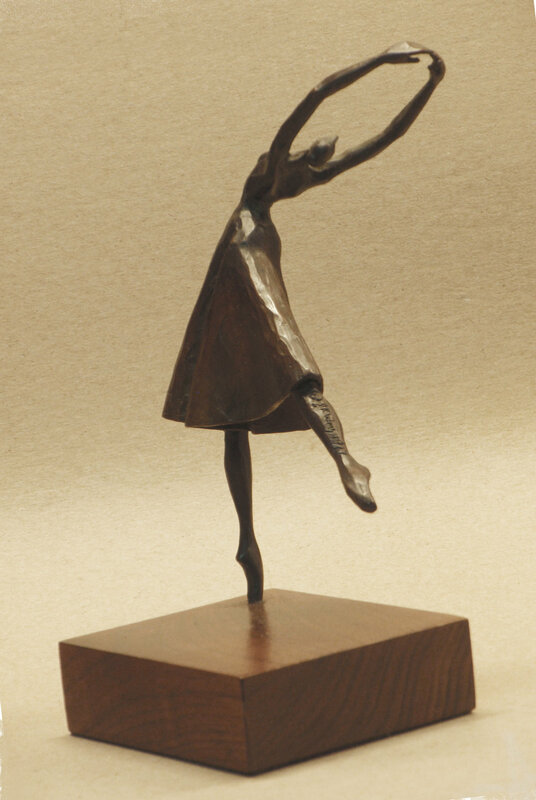 "Back Bend Arabesque" Bronze and walnut 7 1/2 x 5 1/4 x 4"
"Backbend" was a result of my original intent to become a sculptor combined with years of ballet study. After my ballet study, I couldn't miss Degas's nearly complete disregard for the principles of ballet, which adhere to and depend upon the laws of physics. "Brunette on Lavender" Oil 5"x 7"
Note the warm, peachy reflected light under the model's chin in "Brunette on Lavender". "Black Irish" Oil 5" x 7"
"Black Irish" has it's name because this is how dark-haired Irish women are sometimes referred to. The Celtic peoples of Britain were actually brunettes, and the red-haired people we associate with Ireland in particular, got their hair color from their Viking ancestors. "Woman's Foot" is about repose as expressed solely through the model's feet, but it is also about the differing textures of skin, nail enamel and the sage-colored velveteen fabric. "Woman Wearing a Gold Necklace" Oil 24" x 18"
When I painted "Woman Wearing a Gold Necklace" I was still earning my living as a jeweler. This was my first attempt painting gold. Painting jewelry or other types of metal since then has been easy for me, and it probably should be, since for close to a decade I worked with fine metals and stones for forty to fifty hours per week. "Silver Hoops" Oil 16" x 12"
"Silver Hoops" gave me the opportunity to indulge my love of textures, in this case, of the mint blue-green of the model's dress. I also very much enjoyed painting her silver hoop earrings. Note the reddish tones in her hands, under her jaw, and on her hands. Right side of diptych, "Family Affair" Oil 21" x 16"
The right side of the diptych "Family Affair" is a portrait of my younger sister. The left side of the diptych is a portrait of our father and appears in Men. "Japanese Woman" Oil 8" x 10"
The golden background in "Japanese Woman" may appear to be actual gold leaf, but it isn't. I did like the allusion, though, as gold leaf is sometimes used to back a very thin layer of rice paper as a surface for Chinese or Japanese painting. Gold can give such paintings a feeling of formality, richness, and splendor. "The Broken Collarbone" Oil 16" x 12"
The lump on one of the model's collarbones in "The Broken Collarbone" makes this portrait more interesting, as it suggests something about her personal history. Therefore, I happily included it in the portrait, though I could have painted it out. "Fay Reading" is a portrait of my sister when she was in her twenties. 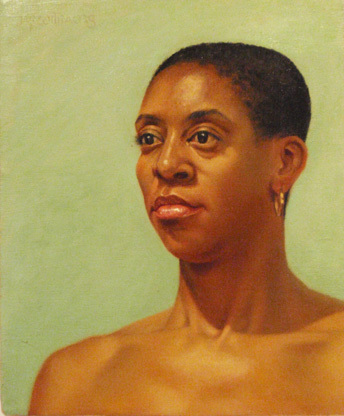 She is several decades older in the diptych "Family Affair". "Black on Mint" Oil 8 "x 10"
"Black on Mint" was an interesting picture to paint, but it was one of the most frustrating studio experiences I've ever had, because she wriggled her face frequently. On of the best model I ever had, who was as "frozen" as a frightened rabbit, practiced yoga and meditation. 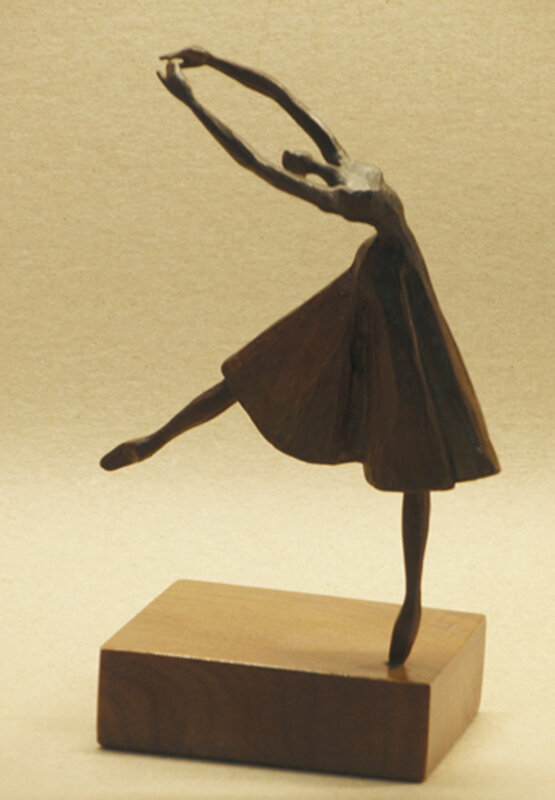 "En Pointe" Bronze and walnut 9 1/8 x 4 1/4 x 3 3/8"
"En Pointe" is another sculpture from my days of passion for both ballet and the three dimensional. While I have given up sculpting due to a lack of the space required for working in three-dimensions, I believe my capacity for thinking in the round is a bonus when working in two-dimensional mediums. "Portrait of Suzanne" was a quick watercolor sketch of a Scottish friend. The very pink cheeks of very fair-skinned Scottish or Irish women and girls is often due to the winds there that agitate or burst the tiny capillaries in this part of the face.